An assorted fruit basket loaded with 14 delicious and fruity surprises of nature. Excite the taste buds with the spell of these luscious delights. All our fruits are freshly picked and packed for next day delivery. Comes in Beautiful Basket elegantly gift wrapped with Ribbon and Free personalised message card. Substitution: All Hamper deliveries are subject to product and seasonal availability of Fruits and Foods Items and may be substituted to ensure your order arrives on time. In some cases, where we do not have some items referenced in the product description in stock, a careful substitutions of equal or greater value will be necessary to match the Theme of the Gift Hamper. In those cases, when possible, we will ask you for permission by Email or Phone to make a substitution. If we are unable to reach you, didn’t receive your reply or there is insufficient time to do so, we will proceed with the substitution.Fresh Food and Fruit Hampers cannot be exchanged or refunded. This does not affect your statutory rights. Some of the products in Hampers and Chocolates contains Nuts, Egg, Milk and other allergens. Please refer to individual product labels for more information. Delivery: All our Hampers including Fresh Fruit, Food and Chocolate Hampers are delivered via courier to arrive on date selected between Monday - Saturday. There are no deliveries on Sunday and Bank Holiday Monday. We offer Hampers and Gifts with next day delivery option based on the ordering time. Deliveries to Channel Islands, Scottish Highlands, Northern Island, and certain Postcodes incl GY, JE, ZE,BT and TR21-TR25 delivery could take 2 -3 Working days and may incur an additional delivery surcharge. 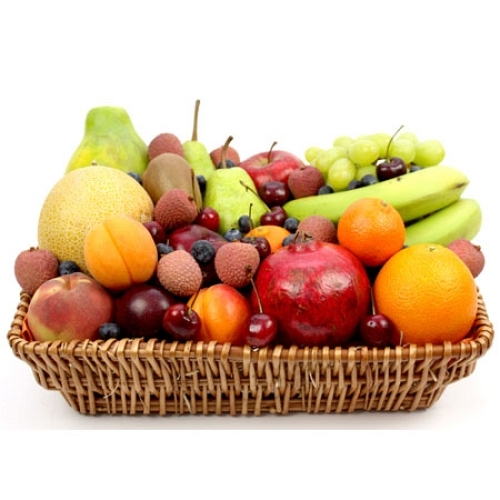 Due to the Fruits Being perishable items and to ensure they arrive in there best our Next day Fruit baskets delivery option is available from Tuesday - Saturday. Orders received after 2pm GMT on Friday will be despatched on Monday for Tuesday Delivery. Presentation and Message Card: We ensure that your items are securely packed and stylishly presented. All our gift baskets come with free message card and a complimentary gift ribbon personalisation service is subject to availability and may vary according to the season.